Hosted by Dr Charlie with help from Mr Lucky – Présenté par Docteur Charlie avec Mister Lucky aux platines. 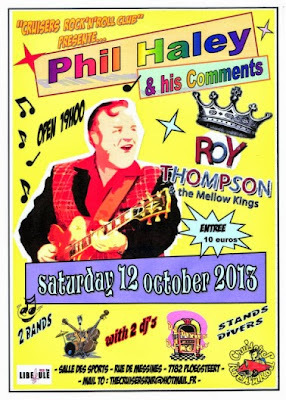 Special edition today, with two hours dedicated to Bill Haley’s musical style, one week before Phil Haley And His Comments’ performance at The Sports Hall of Ploegsteert in Belgium on Saturday, October 12, 2013 (see image). Emission spéciale aujourd’hui, deux heures de musique style Bill HALEY et consorts, étant donné le concert de Phil Haley And His Comments, le samedi 12 octobre 2013 à la Salle Des Sports de Ploegsteert en Belgique (voir affiche ci-dessus). 1. Bill HALEY And His COMETS - "R-O-C-K"
2. Bill HALEY And His COMETS - "Shake, Rattle And Roll"
3. Phil HALEY And His COMMENTS - "Don’t Knock The Rock"
4. Phil HALEY And His COMMENTS - "Everybody Needs To Rock"
5. Bill HALEY And His COMETS - "Hot Dog Buddy Buddy"
6. Lou GRAHAM - "Wee Willie Brown"
7. Al REX - "Hydrogen Bomb"
8. Nick NASTOS - "Bulldoggin’ The Steel"
10. Bill HALEY And His COMETS - "Rock-A-Beatin’ Boogie"
11. Phil HALEY And His COMMENTS - "Burn That Candle"
12. Phil HALEY And His COMMENTS - "Alley Cat"
13. Phil HALEY And His COMMENTS - "Can’t Stop Me From Dreaming"
14. Phil HALEY And His COMMENTS - "Corrine, Corrina"
15. Roy THOMPSON & The MELLOW KINGS - "Alimony Blues"
16. Phil HALEY And His COMMENTS - "Live It Up"
17. Bill HALEY With HALEY’S COMETS - "Whatcha Gonna Do"
18. The KINGSMEN - "It Shoud’ve Been Me"
19. Cappy BIANCO - "The Cat"
20. The JODIMARS - "Let’s All Rock Together"
21. Chuck HESS - "Chuck’s Boogie"
22. Bill HALEY And His COMETS - "Rockin’ Rollin’ Rover"
23. Phil HALEY And His COMMENTS - "Baby Loves Rockin’ It"
24. Phil HALEY And His COMMENTS - "Be By Me"
25. Phil HALEY And His COMMENTS - "Crazy Street"
28. Bill HALEY And The SADDLEMEN - "Green Tree Boogie"
29. Bill HALEY And His COMETS - "Move It On Over"
30. Roy THOMPSON & The MELLOW KINGS - "Guitar Slim"
31. Phil HALEY And His COMMENTS - "Mr Boogie"
32. Phil HALEY And His COMMENTS - "Talk To Me"
33. Phil HALEY And His COMMENTS - "Paris Boogie"
34. Bill HALEY And His COMETS - "The Saints Rock ‘N Roll"
35. Roy THOMPSON & The MELLOW KINGS - "She Went Rockin’"
36. Sally STARR - "A.B.C. Rock"
37. The KINGSMEN - "Better Believe It"
38. Joey MICHEALS - "Sixteen Cats"
40. Phil HALEY And His COMMENTS - "Rock ‘N’ Roll Party"